For movies like A Quiet Place – science fiction-based horror films that aren’t obsessed with appealing to the Blumhouse demographic – tone and atmosphere are the most critical production aspects. This is something Ridley Scott understood as far back as Alien, a film whose influence on A Quiet Place is evident. By emphasizing the “quiet” element of the title and thereby amplifying the impact of even the faintest of sounds, director/co-writer/star John Krasinski puts us on edge. Silence at times becomes claustrophobic, feeding into the escalating suspense that fuels the movie’s forceful and effective audience manipulation. Don’t be fooled by the PG-13 rating – A Quiet Place has an adult aesthetic and younger viewers may be unprepared for its unconventional style and unrelenting intensity. Krasinski’s screenplay (a re-write of a script penned by Bryan Woods and Scott Beck) uses an economy of images (primarily newspaper headlines) to establish the backstory. They year is 2020 and we’re informed via a caption that whatever is happening has been happening for about three months. The “whatever” turns out to be an alien invasion. Unfriendly extraterrestrials have attacked and conquered, leaving isolated bands of humans to survive in near-silence. Since the aliens hunt by sound and apparently have no vision, quietness is paramount. Any loud noise can bring them, and they attack with such swiftness and ferocity that neither fighting nor fleeing represents a viable option. During the film’s first sequence, we are introduced to the five-member Abbott family: mom Evelyn (Emily Blunt), dad Lee (John Krasinski), and their three children – Regan (Millicent Simmonds), who is deaf; Marcus (Noah Jupe), who is ill; and Beau (Cade Woodward), who is too young to fully understand the dangers of noisemaking. Barefoot and careful, they creep around an abandoned drug store, looking for medication to help Marcus. Tragedy strikes on the way home, however, as Beau inadvertently creates a commotion. He is swiftly and brutally dispatched by an alien in one of the film’s most daring moments. A Quiet Place jumps ahead a year. The pain and grief associated with Beau’s loss have diminished but aren’t gone. Teenage Regan is exhibiting signs of rebellion. And Evelyn, pregnant with her fourth child, is approaching her due date. Lee continues to enhance their home’s security measures, which include a colored-light warning system, monitors, and a sound-proof underground room. Everything is in place to protect Evelyn during the delivery and safeguard mother and child afterward – until fate intervenes to put everyone in danger at a critical time. Following Ridley Scott’s 1979 template of not overexposing the aliens, Krasinski mostly avoids long, lingering shots of the creatures (at least until the climax). We catch fleeting glimpses of them in the woods and as they creep around inside the house. Their appearance is a cross between H.R. Giger’s iconic xenomorph and a giant spider. One of the most tense scenes involves a character in a bathtub. Another white-knuckle moment happens in a silo where tons of shifting grain, sucking with quicksand-like efficiency, prove more dangerous than any alien. The use of American Sign Language allows the characters to communicate without speaking. Adding a layer to the importance of silence is the deafness of the oldest Abbott child; several scenes are presented from her perspective and, for those, Krasinski blots out all sound, bathing the theater in stillness. (Actress Millicent Simmonds, the girl from the silent-film portions of Wonderstruck, is deaf in real-life, fulfilling Krasinski’s requirement that Regan be played by a non-hearing actress.) Marco Beltrami’s musical score is understated, adding slight emphasis to certain scenes without ruining the carefully controlled sound design and editing. A Quiet Place is an expertly made “refrigerator movie.” Although gripping, compelling, and exhausting as it unspools, there are a number of logical inconsistencies that emerge post-screening for those who care to put it under the microscope. This is commonly the case with horror films and even the best of the genre aren’t immune. (Why, oh why, did Jamie Lee Curtis throw away the knife in Halloween?) Narrative hiccups of this sort don’t reduce what Krasinski has achieved here. 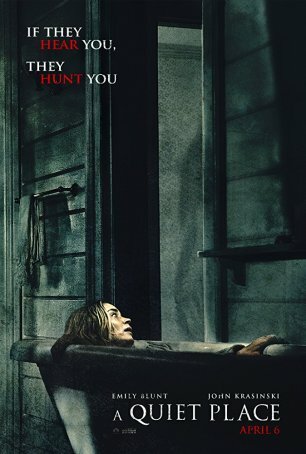 A Quiet Place is a superb exercise in understated terror that puts to shame “horror” films that rely on jump scares and cheap theatrics.